Traditional agents charge high fees and underperform. We can help you sell from just £129, or find a tenant from £59. 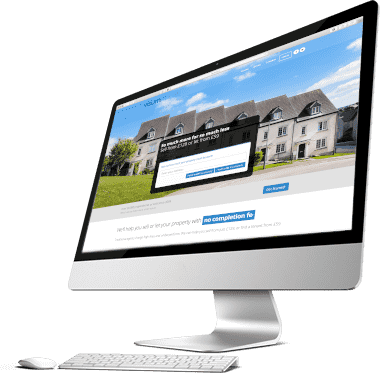 Use our sophisticated tool to generate a sales or lettings valuation, or choose your own figure. Correct pricing ensures you don’t miss out on interest in those crucial first days on the market. Fill out the details of your property in our intuitive form. We’ll guide you in creating appealing details to catch people’s eye. We offer anything from a bare-bones advertising only option all the way up to a full service. Choose exactly what you want from us, and what you don’t. All accounts and adverts require verification. It’s a simple process that normally takes just a few hours and once completed successfully your listing will go live on your chosen portals. You’ll receive notification of every new enquiry and you can manage your prospects in our bespoke messaging system, keeping notes along the way if you wish. Alternatively you can move the enquiry out to phone or email contact. Viewings can be carried out by you or by us. Once you have found the right person for your property we can get you to let or sale with a range of helpful services, including identity and credit checks, insurance and tenancy paperwork for renting, or solicitors, surveyors and mortgage help for selling. No commission, no hidden fees. We'll do what you want, and not what you don't. Use the calculator to see. The difference is significant...and stays in your pocket. Our systems work 24/7/365 for both you and your prospective buyers. You can make changes to the details, photos or price as often as you like. Your edits will take effect almost instantly. You'll be notified of new enquiries instantly by email. You can talk to buyers & arrange viewings in your seller's hub. Within hours your property can be visible to a huge audience of homeseekers. Your property will be on all of the major sites, being seen by the right people. Our system is so intuitive you won't need human contact, but we're there if you do. Unlike some others, we won't sell or rent out your data for a profit. Engage with enquiries and viewing requests when it fits your busy schedule to do so. You manage your ad and photos. Edit them any time you like. Our COMODO certified, encrypted website and backend systems protect you. Your property will appear on the leading websites, to be seen by millions of potential buyers. I loved the ease of use. Prompt responses to my emails and very helpful advice. Loved the way I could edit and update the advert. Really pleased with the whole experience. Very easy to use and very efficient. Thank you. I let this property within a day of you advertising it! so easy to use, you have thought of everything. Quick and easy with good communications, also recommend using Visum for credit/reference checks. Everything!! Especially how easy it is to create and edit the adverts and how fast it was put on rightmove. I got about 20 enquiries in 2 days!! Easy website to navigate. Very helpful staff, ie Mike. Professional and easy to use and effective. Wide range of advertising, price and ease of website use. I like the notes option and messaging service. "Service above and beyond expectations."" "I have always found the service 100% and I would not change for anything.""